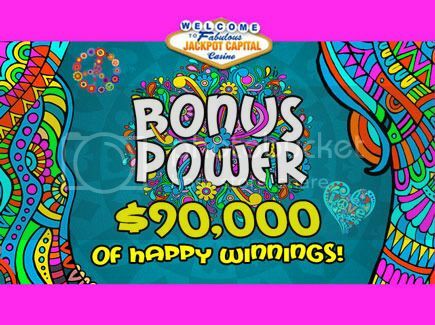 September 21, 2015 &#8211; London, UK (Press Release) &#8211; The Beatles said all you need is love but Jackpot Capital Casino players are flashing back to the Summer of Love for $90,000 in casino bonuses. Every Monday until October 18th, top players will receive $15,000 in bonuses, and every Friday $5000 will be randomly awarded. Jackpot Capital players earn scoreboard points by playing in either the online casino or the new tap-and-swipe mobile casino (Mobile - Jackpot Capital). Players can check their current ranking any time at Bonus Power | Jackpot Capital where complete contest details are also available. They&#8217;re encouraged to visit the casino&#8217;s Facebook page frequently for additional bonus offers that will only be announced there. Jackpot Capital Casino has a huge selection of games from Realtime Gaming including the new Pirate Isle which just made its debut in the online casino and Mermaid Queen which was just added to the new mobile casino for smartphones and tablets. Jackpot Capital Casino is awesome!! Thanks Ashley! !